Underground access is only allowed to properly equipped cavers and mine explorers with BCA or similar public liability insurance WHO ARE FULLY AWARE OF THE RISKS INVOLVED AND ARE WILLING TO ACCEPT THEM. Every group shall be led by a competent person who is able to access risk and make appropriate mitigations. Although there is a fence to prevent accidental public entry the company does not fit gates therefore there are no keys or combinations to be obtained. If you are a club, please contact us and let us know who you are. 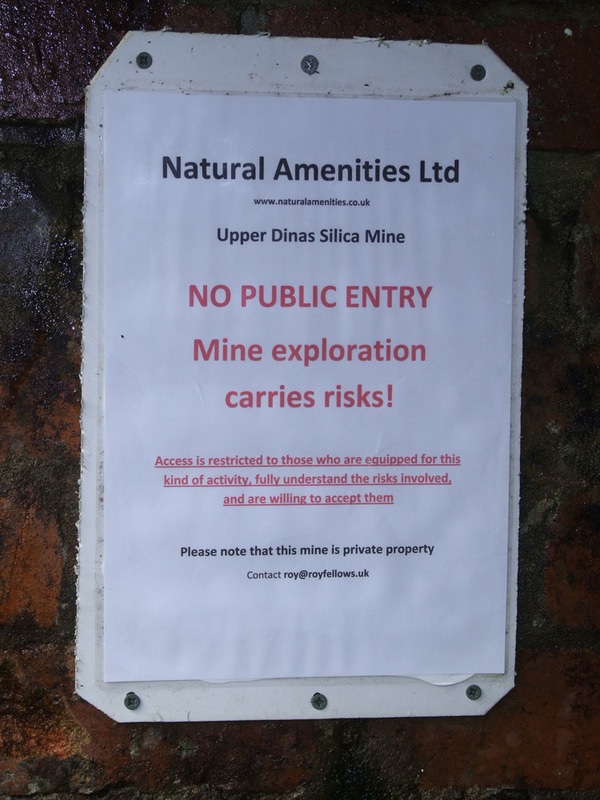 THERE IS NO GENERAL PUBLIC RIGHT OF ACCESS TO THE MINE. IF YOU ARE NOT EXPERIENCED AND EQUIPPED TO GO UNDERGROUND PLEASE. READ THE FOLLOWING WHICH IS GENERAL AND NOT APPLICABLE TO ANY ONE PARTICULAR SITE. #1 NEVER RELY ON ONE SINGLE SOURCE OF LIGHTING, EXPLORING WITH A SINGLE TORCH IS A NO BRAINER. #2 DOING THIS ON YOUR OWN IS ASKING FOR IT. #4 WEAR A HARD HAT, I PROBABLY PLEAD IN VAIN. A QUICK TRIP INTO A SLATE MINE PASSAGE OF 10 METRES BY AN EXPERIENCED PERSON BUT NO HELMET WHO SHOULD HAVE KNOWN BETTER. = 7 STITCHES AND PERMANENT SCAR. # 5 DON'T WALK AROUND AND LOOK AROUND AT THE SAME TIME. #6 FINALLY, IF YOU WANT TO GO UNDERGROUND JOIN A CAVING OR MINING CLUB, OR STAY OUT AND KEEP OUT. Insurance is the responsibility of the group organisers and is beyond our remit.